The Droids edition of the Boba Fett figure is one of the rarest and most sought-after of all vintage Star Wars figures. What you see here is one of the earliest carded samples of this item known to have been created. As you might be able to tell from the photo, the bubble is rough and was cut by hand (notice its square bottom corners and the rough shape of its coin area). Unfortunately, the tape used to affix these sample bubbles to their cards is prone to losing its tack. Consequently, the upper part of this bubble lifted at one time and the coin fell out (a new one has been placed inside). Here's the back. Notice the velcro tabs. Kenner frequently applied velcro to the packages of toys which they intended to use in presentations, such as Toy Fair. It allowed the toys to be affixed to a wall or display. But perhaps the most notable features of this piece are the lower two corners of its blister card. They're rounded. 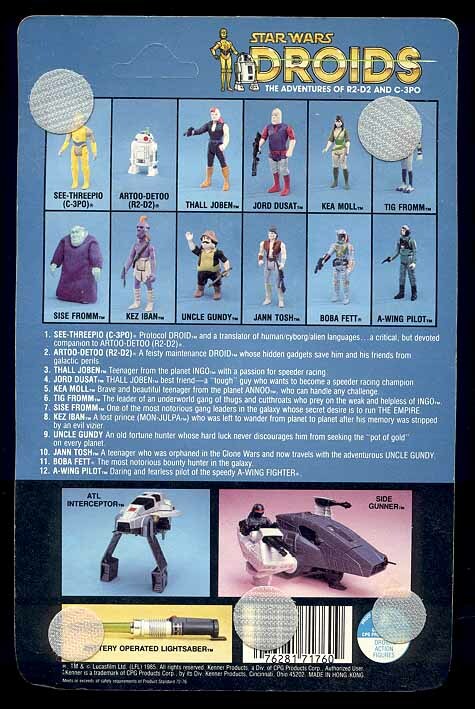 This is significant because, while most Kenner figures had round blister card corners, the regular issue of the Droids Fett had square corners on the bottom of its card. Now, when you consider that many carded samples feature square bottom corners (because they have been made using proof cards), this Fett piece becomes kind of extraordinary. Although it's a sample, it has rounded corners, even though its production counterpart has square ones. Weird, huh? It should also be noted that the hang hole on the blister card is unpunched. No one I know has ever seen or heard of a Droids Fett that was in this state. It's possible that all the examples of the figure that were released to stores were punched. Anyway, it's a cool piece. 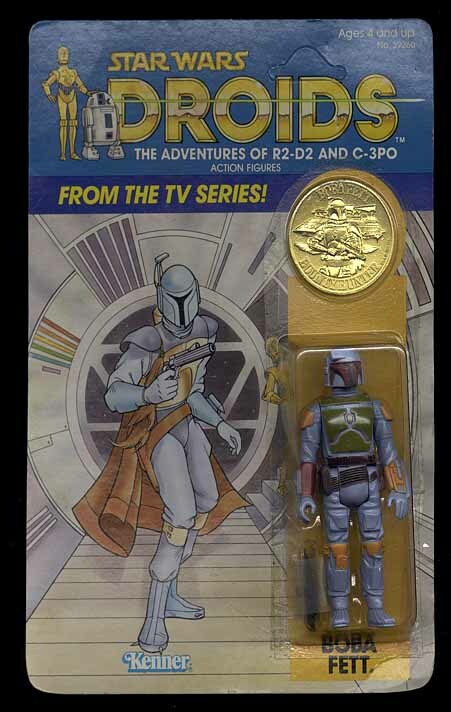 It's probably the only carded Fett samples I've heard of aside from the Star Wars-logo one seen here.